Montaigne. Montaigne, photograph. The Library of Congress. French author Michel de Montaigne, the inventor of the essay form as a literary genre, raised introspection to the level of art in his monumental Essays (1580). The French essai means an experiment, test, or attempt, and such was Montaigne’s intention in his writing: to attempt to understand himself, and by extension, the human condition. In so doing, Montaigne extended his questioning to the very limits of human knowledge. His sustained skepticism contributed to the development of what is today termed ‘‘critical thinking,’’ at the heart of the humanities. Well-Educated in Youth. Montaigne was born Michel Eyquem in 1533 at his family’s estate in the district of Perigord, in the Gascony region of France. Although his forebears had long been bourgeois traders, in 1477 his great-grandfather had purchased the chateau of Montaigne, along with the right to add the noble title ‘‘de Montaigne’’ to the family name. Montaigne was the first in his family to drop the name Eyquem, shedding the last traces of his family’s roots in commerce. His father, Pierre Eyquem, figures prominently in Montaigne’s writing. Pierre Eyquem de Montaigne took great care in planning his son’s education. He sent his son to spend his infancy with peasant godparents, so the future lord of Montaigne might develop a sense of attachment to the lower classes. He also required that the household speak to the boy exclusively in Latin. At age six, Montaigne was sent to the finest school in Bordeaux. He completed its twelve-year curriculum in seven years. His activities after leaving the school are unclear, but it is thought that he studied law, possibly at Toulouse. Young Magistrate. In 1557, Montaigne became a councilor in the Parliament of Bordeaux. He remained a magistrate until 1570, and while he mentions these years infrequently in Essays, they had great impact on his life. Scholars have argued that Montaigne’s legal training shaped the literary form of his writing by informing his method of analysis and exposition. At this time, France was ruled by the Valois dynasty, Henry II (who reigned from 1547 to 1549), Charles IX (who reigned from 1560 to 1574), and Henry III (who reigned from 1574 to 1589). France went through a series of Italian wars through the 1550s, which the French lost but gained the influence of the Italian Renaissance. The Reformation became bigger and more bitter as Protestants (known in France as Huguenots) fought Catholics for power. The policy of the French monarchy was generally to suppress Protestantism at home. By the 1560s, the first of eight civil wars broke out in France, dubbed the Wars of Religion, over this divide. During this period, Montaigne grew very close to a colleague in Parliament, Etienne de La Boetie, who came to be more important to Montaigne than anyone, and was the subject of his famous essay, ‘‘On Friendship.’’ Their friendship was cut short, however, when La Boetie contracted an intestinal ailment. Montaigne hardly left his friend’s bedside, even though both men feared that La Boetie had the plague and might be contagious. La Boetie died in 1563. A few years later, Montaigne married Framboise de La Chassagne, whose father and brother held seats in Parliament. The couple had six daughters, but only one survived to adulthood. Began Writing Essays. At the request of his ailing father, Montaigne translated a theological treatise, Liber Creaturarum, by a fifteenth-century Spaniard, Raymond Sebond. The translation marked his first tangible step toward becoming a writer. During the Renaissance, translation was considered an appropriate training for literary endeavor. In 1568, Pierre Eyquem de Montaigne died, leaving his son as the new lord of Montaigne. At thirty-eight years of age, Montaigne surrendered his seat in Parliament, and retired to his estate, to what he hoped would be a life of quiet study and composition. He began the task of writing Essays, which would occupy him for the rest of his life. Montaigne’s Essays consists of three books and 107 chapters, which range in length from a few paragraphs to over a hundred pages. They treat myriad subjects, from the trivial to the profound—from the author’s attitude toward radishes, to his sexual tastes, to his feelings about God. Montaigne’s trademark thoughtful skepticism runs throughout the essays. The author took for his motto the words, Que sais-je? (‘‘What do I know?’’). Diplomatic and Government Service. Montaigne composed the early chapters of Essays in the wake of the Saint Bartholomew’s Day Massacre of 1572, in which the bodies of slain Huguenots in Paris were thrown into the Seine, turning it red with blood. During this time, he was called upon to act as a negotiator between Henri de Navarre, leader of the Protestant armies (and later King Henry IV of France), and Henri de Guise, the charismatic leader of the Catholic League. Amid his diplomatic and military service, Montaigne was made a Gentleman of the Bedchamber, an office that gave access to the king without requiring residence at court. The first two books of Essays were published in 1580. Montaigne then set out on an extensive journey through France, Italy, Switzerland, and Germany. He kept a private journal of his trip, which was rediscovered in 1770 and published in 1774 as The Journal of Montaigne’s Travels. While still traveling, Montaigne learned to his dismay that he had been elected mayor of Bordeaux. Montaigne tried to refuse the responsibility, but finally consented and arrived home after an absence of seventeen months. He served two terms as mayor, from 1581 to 1585, and promoted reforms on behalf of foundling children and female prisoners. In addition, he prevented the gentry of Bordeaux from gaining exemption from taxation. In 1588, on a secret mission to King Henry III from Henry of Navarre, he was detained by Protestants. A few months later, Montaigne found himself briefly imprisoned in the Bastille by the Catholics. Revised Essays. Despite the demands of public office, Montaigne did not abandon his literary endeavors. A second, expanded edition of Essays was published in 1582. For the next six years, Montaigne continued to make editorial changes to the existing chapters and to write new essays. In 1588, he combined both the revised and the new essays into a third edition, which would be the last published during his lifetime. Montaigne died at his home on September 13, 1592. Sir Philip Sidney (1554-1586): English poet and courtier, who wrote An Apology for Poetry (1595). Sir Walter Raleigh (1552-1618): English poet, courtier, and explorer of the New World. His poems include The Nymph's Reply to the Shepherd (c. 1585). Pierre de Ronsard (1524-1585): French ''prince of poets,'' immensely popular in his time, and prominent in the canon today. His poems include ''Hymne de la France'' (1549). Christopher Marlowe (1564-1593): English dramatist and poet; author of the poem ''The Passionate Shepherd to His Love'' (c. 1590s). Queen Elizabeth I (1533-1603): queen of England, 1558-1603, known as the Virgin Queen, daughter of King Henry VIII. Catherine de Medicis (1519-1589): queen consort and regent of France; mother of French kings Francis II, Charles IX, and Henry III. The essay, the literary genre associated with Montaigne, is a powerful format for communicating ideas analytically and persuasively. The following are among the world's most famous essays. Moral Epistles (64 B.C.E. ), by Seneca the Younger. These letters by the ancient Roman philosopher-playwright were one of the inspirations for Montaigne's writings. ''A Modest Proposal'' (1729), by Jonathan Swift. In this satirical pamphlet Swift suggests that in tough economic times, the Irish should consider selling poor children to be consumed by the wealthy. Common Sense (1776), by Thomas Paine. This pamphlet, one of the best-selling pieces of literature in eighteenth- century America, helped persuade Americans to revolt against British rule. "Self-Reliance" (1841), by Ralph Waldo Emerson. This essay outlines many of the precepts of nineteenth-century Transcendental philosophy. Emerson encourages the reader to follow his or her own instincts and to appreciate the beauty of nature. ''Shooting an Elephant'' (1936), by George Orwell. In this essay, a devastating critique of imperialism, Orwell recounts how he was forced to shoot an elephant in occupied Burma. ''Down at the Cross: Letter from a Region in My Mind'' (1962), by James Baldwin. In this essay, Baldwin eloquently analyzes race and religion in America. As a child, Montaigne received the careful attention of private tutors. The Latin works of the ancient Romans, such as Ovid, Virgil, and Plautus, constituted his pleasure reading. One of his favorite books was Seneca’s Epistles to Lucilius, and the early chapters of his Essays cite and paraphrase it abundantly. With its lessons of self-mastery in the face of adversity, Seneca’s Stoic philosophy must have seemed well suited to the times. Contending with the Classics. Seneca’s epistles also influenced the literary form Montaigne was elaborating, for Montaigne expresses admiration for the epistolary form. On a more general level, Essays grew almost organically out of Montaigne’s notes on Seneca—and, indeed, on many other books. The practice of marginalia (writing commentary in the margins) was an important factor shaping the genesis of his text. Essays resembles a compendium of ancient philosophy and history. Montaigne quotes and paraphrases such ancients as Plutarch, Aristotle, Cicero, and Caesar. He thus established the literary principle of the seventeenth century: respect for and imitation of the classics. However, Montaigne’s references highlight discrepancies, rather than continuities, between these thinkers. The intellectual technique of weighing one idea or one author against another defines the essay as Montaigne invented it. Radical Skepticism. In Essays, Montaigne’s literary and philosophical preoccupations converge. The unifying concept is honest introspection and self-discovery. Commentators assert that beyond Montaigne’s egoism lies a higher purpose. Believing as he did that he, as one man, manifested within himself the quintessential humanity common to all people, Montaigne held that in seeking to understand his individual self, he was examining the universal traits of humanity. His approach is informal and meandering. He moves from one subject to another, following a train of thought or an association of ideas. This rambling, intimate style and unpretentious manner foster a sense of camaraderie between writer and reader that largely accounts for the work’s success. Classical and contemporary quotations are liberally sprinkled throughout Essays, testifying to Montaigne’s wide range of knowledge. Scholars have traced in his work the influence of a wide array of thinkers beyond Seneca, including Socrates, Aristotle, Epicurus, and the Stoics. But by far the most consistent element of Montaigne’s thought is Pyronnism, or radical skepticism. He holds that presumption blinds a thinker, making one too willing to think one knows what one does not know. He shares Socrates’ belief that awareness of one’s ignorance is the key to wisdom. The Subject of Self. The early chapters of Essays are similar to Renaissance miscellanies (a collection of literary works, originally of poems), a contemporary genre defined by its variety. But as his project developed, Montaigne departed from this model. His essays fall outside the literary conventions of his era, both because of their skepticism and their author’s intention to compose a multidimensional self-portrait. Influence. The centrality that Montaigne accorded to the self earned him illustrious admirers and imitators. Countless writers and thinkers have been influenced by his ideas and his literary style, including Francis Bacon, William Shakespeare, Rene Descartes, Jean-Jacques Rousseau, Friedrich Nietzsche, and Sigmund Freud. One prominent detractor was the seventeenth-century French philosopher Blaise Pascal, who denounced Montaigne’s decision to focus upon himself. He decried Montaigne’s work as impious and vain, as well as intellectually specious in its meandering technique. Montaigne’s towering achievements—the invention of a powerful method of written expression, and the assertion of the personal perspective in literature—have fascinated critics for centuries. Critics have also long debated the ideas and opinions in Montaigne’s most famous pieces— subjects such as friendship, religion, humanism, monarchy, the discovery of the New World, and the aptitudes of women. Ultimately, many conclude, it is not Montaigne’s answers that matter, but his questions; not his precise philosophy, but his method of exploring it; not the conclusions he drew, but the self-examination he undertook. Essays. With Essays, scholars have carefully studied him from a stylistic viewpoint, considering him a pioneer of the essay form, specifically the genre of the personal essay. As Joseph Epstein expressed it in Commentary, Montaigne ‘‘put the capital I, the first person, into literature, and while he was at it also invented the essay.’’ The self that Montaigne laid bare in his essays, although it contains numerous ambiguities and apparent contradictions, affords an unusually complete and panoramic view of the individual soul. The nature of Montaigne’s self-representation within his essays has been studied by a number of critics. 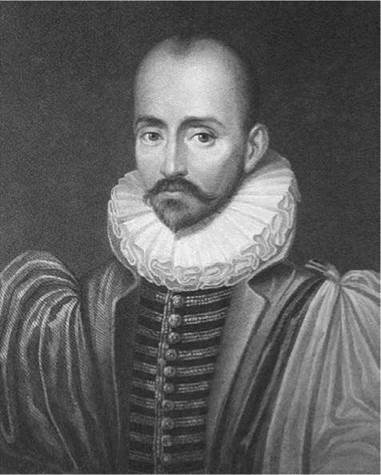 Hope H. Glidden in Renaissance Quarterly, for example, maintains that Montaigne’s strategy was to warn his readers ‘‘that the man and his words are not one... the face of Montaigne is laid bare but its very openness cannot be taken at face value.’’ Much of the scholarship in Essays is devoted to the discovery and acknowledgment of the many ambiguities and apparent contradictions within the text. 1. Write an analysis of one or two of Montaigne’s essays. What procedures does he use to explore a subject? 2. How does Montaigne’s focus on self-knowledge enhance, or detract from, the persuasiveness of his arguments? Write an essay that explains your conclusions. 3. Consider the ways that Montaigne quotes from and refers to classical authors. What are his objectives in compiling and commenting on other works? Create a presentation that outlines your findings. 4. Scholars have debated the influence of numerous philosophers on Montaigne’s thinking. Does he take a consistent philosophical stand throughout Essays or do his views evolve as the work progresses? Write an essay that outlines your argument. 5. Identify some instances where Montaigne violates literary conventions or expectations, especially when discussing controversial subjects. Explore the purposes, and the effects, of such transgressions in a paper. Bencivenga, Ermanno. The Discipline of Subjectivity: An Essay on Montaigne. Princeton, N.J.: Princeton University Press, 1990. Benson, Edward. Money and Magic in Montaigne: The Historicity of the “Essais”. Geneva, Switzerland: Librairie Droz, 1995. Berven, Dikka, ed. Reading Montaigne. London: Routledge, 1995. Bloom, Harold, ed. Michel de Montaigne: Modern Critical Views. New York: Chelsea House, 1987. Burke, Peter. Montaigne. Oxford: Oxford University Press, 1981. Coleman, Dorothy Gabe. Montaigne’s “Essais”. London: Allen & Unwin, 1987. Cottrell, Robert D. Sexuality/Textuality: A Study of the Tabric of Montaigne’s “Essais’’. Columbus: Ohio State University Press, 1981. Frame, Donald M. Montaigne: A Biography. New York: Harcourt, 1965. Friedrich, Hugo. Montaigne. Berkeley and Los Angeles: University of California Press, 1991. Hoffmann, George. Montaigne’s Career. Oxford: Clarendon, 1998. Rider, Frederick. The Dialectic of Selfhood in Montaigne. Stanford, Calif.: Stanford University Press, 1973. Screech, M. A. Montaigne and Melancholy: The Wisdom of the ‘‘Essays’’. London: Duckworth, 1983. Woolf, Virginia. The Common Reader. London: Hogarth, 1925. Epstein, Joseph. ‘‘Reading Montaigne.’’ Commentary, March 1993, 34-41. Glidden, Hope H. ‘‘The Face in the Text: Montaigne’s Emblematic Self-Portrait (Essais III:12.’’ Renaissance Quarterly 46, no. 1 (Spring 1993): 71-97.